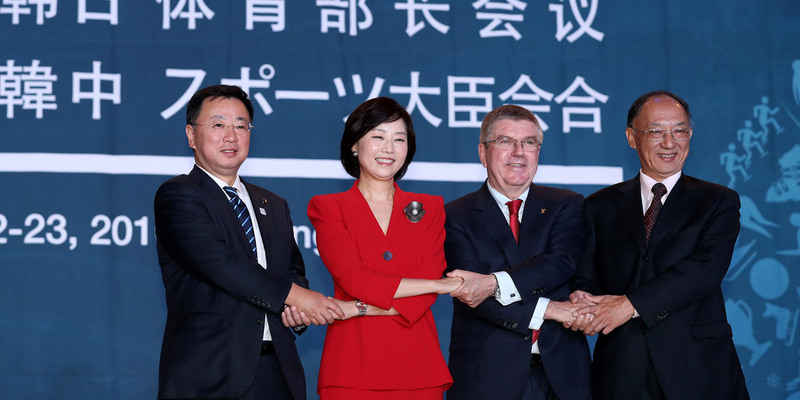 Sports Ministers from South Korea, China and Japan meet in 2016 in Pyeongchang. Photo by Republic of Korea via Flickr, licensed under (CC BY-SA 2.0). At a conference in Singapore at the end of June to rollout a new report on Chinese public diplomacy, one keynote speech set the stage for a vigorous diplomatic exchange on the issue in real-time. 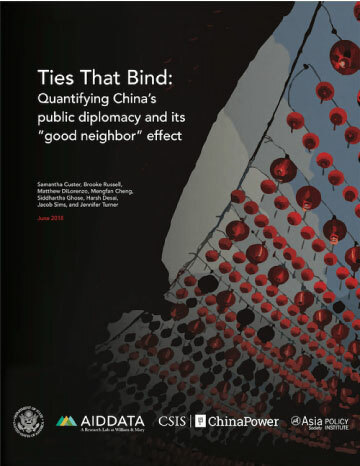 The report, Ties That Bind: Quantifying China’s public diplomacy and its “good neighbor” effect, was produced by AidData in partnership with the China Power Project at CSIS and the Asia Society Policy Institute. It is the first effort to systematically quantify four key dimensions of Chinese public diplomacy (elite-to-elite, exchange, financial, and cultural activities) across 25 countries in the East Asia Pacific region. Public diplomacy refers to those activities undertaken by state and non-state actors from one country (in this case, China) that have some intention of favorably influencing citizens of another country. In his keynote speech at the report’s launch event, hosted by the S. Rajaratnam School of International Studies at the Marina Mandarin in Singapore, retired Singaporean diplomat Bilahari Kausikan characterized China’s “influence operations” as “psychological manipulation” and warned Singaporeans to be aware of efforts to “persuade, induce and coerce” them to follow China’s interests and adopt its positions. The remarks by Bilahari — a prominent voice on Singapore’s foreign affairs who served as its ambassador-at-large, permanent secretary for foreign affairs, permanent representative to the UN, and ambassador to Russia over his 37-year career — were quickly picked up by Singaporean media outlets. The conversation they sparked continued in a flurry of op-eds and letters, culminating in a response from Hong Xiaoyong, the Chinese ambassador to Singapore. Watch Sam Custer, AidData’s director of policy analysis, and Brad Parks, AidData’s executive director, discuss the report’s findings. While the Ties That Bind report provoked strong debate, seeing past the news ticker of dueling headlines generated — “China does not manipulate other countries: Chinese ambassador responds” (The Straits Times) and “China Spends Big to Win Friends and Influence Across East Asia” (Bloomberg) — to understand what is happening on the ground is made possible by the study’s data-driven approach. Previous studies on China’s public diplomacy have relied almost exclusively on qualitative metrics that offer valuable context-specific insights, but fall short of providing a systematic way to understand how and where China deploys its public diplomacy efforts. To this end, AidData and its partners collected extensive quantitative data on China’s public diplomacy activities from 2000-2016 in 25 East Asia and Pacific countries. Drawing from from academic datasets, government records, previous studies, and AidData’s Tracking Under-reported Financial Flows (TUFF) methodology, the report breaks new ground to quantifiably measure a much broader range of activities than has been previously attempted. Explore dynamic figures and detailed maps of China’s public diplomacy activities by country. The resulting headline numbers jump out: $45 billion in spending with diplomatic intent from 2000-2016, 95% of which was on infrastructure. A 115% increase in the number of sister city partnerships, China’s prime vehicle for exchange diplomacy. 159 new Confucius Institutes and 89 new Confucius Classrooms (Beijing’s signature cultural initiative to promote Mandarin language and Chinese culture) since 2004. More visiting elites entertained by China than any other country. But beyond just providing novel data, the report also focuses on rigorous analysis of the factors that drive Beijing to target countries for certain kinds of public diplomacy activities, as well as China’s ability to translate these upstream inputs into a ‘good neighbor’ dividend: more favorable public perceptions of China and closer alignment with Beijing in the policy decisions taken by policymaking elites. Need the short scoop? Read our launch blog highlighting the report’s methods and major findings. Ambassadors Bilahari and Hong respectively expressed wishes for greater “exposure” of how China seeks to influence foreign citizens and less “misunderstanding” of China’s actions. While their editorials may sit on opposing sides of the debate, these goals are not opposite. This report helps increase the understanding of scholars, practitioners, and observers of Chinese public diplomacy regarding which tools Beijing deploys, with whom, and with what effects, and serves as a first step forward in a larger journey to uncover the full extent of China’s public diplomacy activities — which would improve clarity for all. 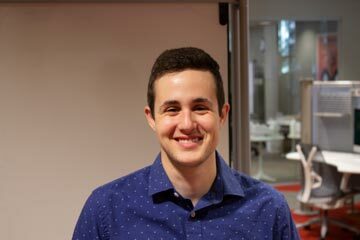 The study, Ties That Bind: Quantifying China’s public diplomacy and its “good neighbor” effect, was conducted with generous support from the United States Department of State and in partnership with the Asia Society Policy Institute and the Center for Strategic and International Studies.